Wolf Commercial Real Estate, the foremost South Jersey commercial real estate brokerage firm with expertise in Southern New Jersey commercial real estate listings and services, is now offering South Jersey retail space for lease in the Pep Boys Plaza Shopping Center in Cinnaminson. This Southern New Jersey retail space for lease at 202 Route 130 North Cinnaminson NJ is located in a retail strip center on the heavily traveled corner at Route 130 and Highland Avenue, providing maximum daily exposure to thousands of potential customers. This Cinnaminson retail space for lease has two units now available for lease. One unit in this South Jersey retail building for lease provides 1,600 square feet of retail space in Cinnaminson, and the other features 7,130 square feet of retail space in South Jersey. There is both storefront and pylon signage available to tenants at this South Jersey retail building for lease. The asking lease rate for this retail space in Cinnaminson is $15.00/SF NNN. 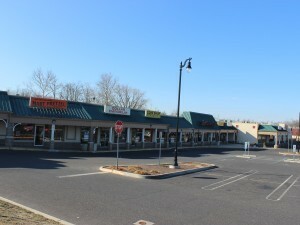 This Southern New Jersey retail space for lease in the Pep Boys Plaza Shopping Center at 202 Route 130 North Cinnaminson NJ is being offered for immediate occupancy through Wolf Commercial Real Estate, a South Jersey commercial real estate broker that specializes in Southern New Jersey commercial real estate listings and services. Other tenants in this Cinnaminson retail space for lease include Pep Boys, Subway, Eastern Dental, Zio’s Tuscan Grille and more. This South Jersey retail space for lease is located directly across from The Shoppes at Cinnaminson, a South Jersey retail power center. Among the other retailers in the immediate vicinity of this retail space in South Jersey are TD Bank, Dunkin Donuts, McDonald’s, Burlington Coat Factory, ShopRite and many other national chains. More than 360,000 residents and potential customers live within a five-mile radius of this South Jersey retail building for lease at 202 Route 130 North Cinnaminson NJ. The average household income in the same area near this Southern New Jersey retail space for lease is $65,982. This retail space in South Jersey is available through Wolf Commercial Real Estate, a South Jersey commercial real estate brokerage firm with expertise in Southern New Jersey commercial real estate listings and services. Parking is abundant at this Cinnaminson retail space for lease with parking ratio of 4.08/1,000 sf. On average, more than 55,000 vehicles per day drive through the intersection of Route 130 and Highland Avenue, where this Southern New Jersey retail space for lease is located. For more information about this South Jersey retail space for lease in the Pep Boys Plaza Shopping Center at 202 Route 130 North Cinnaminson NJ, about other retail space in Cinnaminson or about any other South Jersey commercial properties for sale or lease, please contact Jason Wolf (856-857-6301; jason.wolf@wolfcre.com) at Wolf Commercial Real Estate, a South Jersey commercial real estate broker. Wolf Commercial Real Estate is a leading South Jersey commercial real estate broker that provides a full range of Southern New Jersey commercial real estate listings, marketing commercial offices, medical properties, industrial properties, land properties, retail buildings and other South Jersey commercial properties for buyers, tenants, investors and sellers. Please visit our websites for a full listing of South Jersey commercial properties for lease or sale through our South Jersey commercial real estate brokerage firm.